How many of you had dreams and aspirations of having your very own action figure? It isn&apos;t every day the opportunity arises for anyone, so when we got a glimpse of the cover of Travi$ Scott&apos;s upcoming debut studio album, Rodeo, we knew that he was making a life-long dream into a reality. While photographer Kevin Amato immortalized the sixth-scale masterpiece on the album cover, Dan Chung was the craftsman who took the figure from ethereal concept to physical object. Born in New York and grew up in Texas, Chung isn&apos;t your typical toymaker. He studied economics at Harvard before he met Spike Lee, who had him come work on the set of CLOCKERS, where he fell in love with film. He went back to school to get his master&apos;s in film production and subsequently started making indie films in L.A., where he currently lives. He also launched a toy company on the side for fun. His love for action figure customization became more and more prevalent as he got to be on set with stars, like his first action figure, Jackie Chan—made while on the set of Rush Hour. 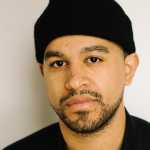 He&apos;s since made a name for himself in the toymaking industry, which drew the attention of Travi$&apos; team, who had a unique vision the Texas rapper hoped Chung could relate to. 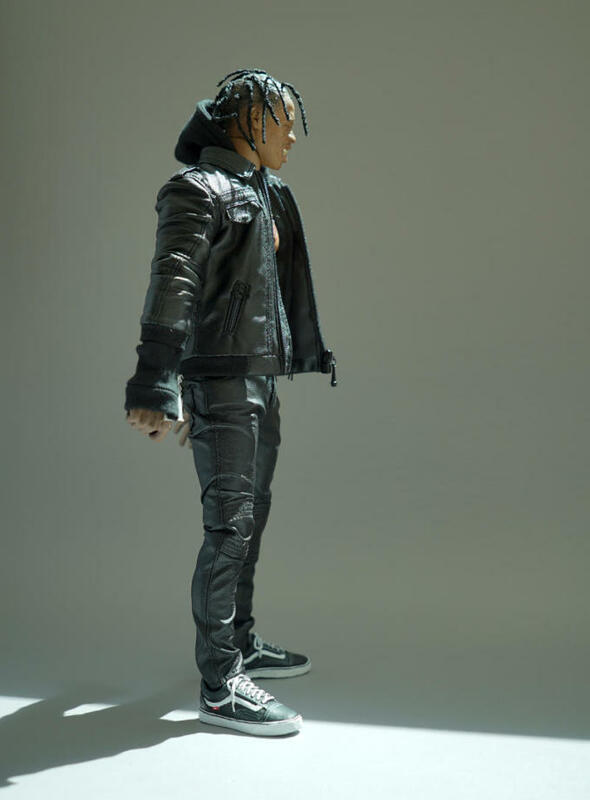 As it turns out, they saw eye-to-eye from the very beginning, carefully crafting two action figures in Travi$&apos; image, capturing everything the Rodeo artist wanted to relay to his fans. 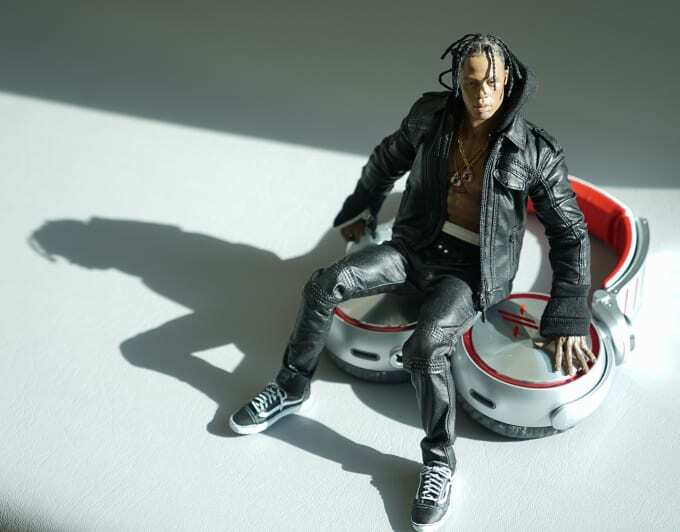 How did Travi$&apos; camp contact you to do the action figure? I got an email from the VP Creative at Epic Records out of the blue. She had found my work online and was convinced I was the one who should make this figure for Travi$. He had this idea of wanting to do something with action figures. I got on a conference call with the rest of the Epic team and Travi$&apos; team after that, and it was a go. Did you have any inclination they were going to use it for his album cover? They told me straight up it would be used to promote his album, hopefully make it onto the cover and poster. 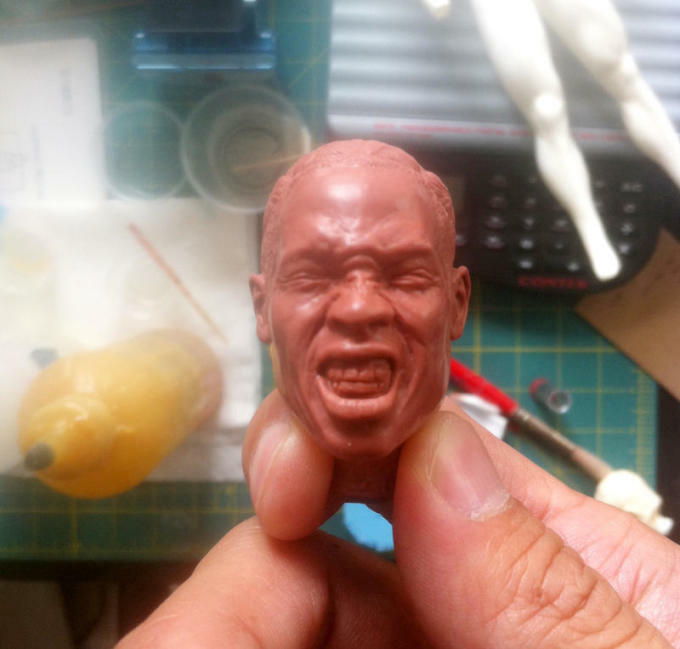 They invited me to his house where we talked about this project, how to get the figure made, possibly mass-produced, what scale it would be in, whether a smaller scale figure could be produced and packaged with his album, etc. I took some reference snapshots of him and his tats, and came up with the idea that he should give me a scowl with his grill for an alternate head sculpt. It took me a couple of weeks to sculpt the heads and get the figure together. At that point, I didn&apos;t need to prepare any mass-production masters or elements, just a photogenic prototype, so it was a pretty short turnaround. What was the process in creating it? Were they providing direction or did they let you work your magic? Process-wise, I&apos;m old school. No software, no scanning, no 3D printing. I study the reference photos and hand-sculpt the head out of wax, using needles, picks and a magnifying glass. From there, I make a silicone mold, cast in resin, and paint it up. This was a bit trickier than usual because of his braids (which are real on the figure, btw.) The body was heavily modified to reflect Travi$&apos; slim build, and the clothing was a custom look I created from various pieces that were re-tailored for a precise fit. For the shoes, I was going to sculpt a pair of Yeezys, but in the end decided to go with the Old Skool Vans to match a photoshoot he&apos;d just done. Since I&apos;m also a filmmaker/photographer, and especially as miniatures photography is a craft unto itself, I did three days of shoots on the figure when it was done. As a sixth-scale enthusiast, I try to make my photos of the figures deliver this moment of incomprehension—is that real? or is that a figure?—and see how long I can make that magical confusion last. That&apos;s the goal, but there&apos;s this fine line because if it&apos;s too obviously a doll, people may only think "oh cool, a doll", but if it&apos;s too realistic, people will just decide it&apos;s real and move on. So you try to give clues that it&apos;s not real (like posing it with full-size props), while it&apos;s so real-looking people aren&apos;t sure and do a double-take. I keep these considerations in mind while sculpting and photographing. In the end, though, Travi$ was after a different response—less-refined, rougher, maybe more outlandish -- and had a photographer friend in NY he wanted to shoot the figure; he&apos;s loyal like that. The photographer you worked with to turn this into the album cover, Kevin Amato, mentioned this was kept heavily under wraps and was basically flown around by execs from place to place to make sure nobody caught wind of it. Why do you think they were so protective? I suppose the figure, as a conceptual and real work of art, represents a fairly considerable investment of time and money by Sony Music. They eventually came to me because, of the handful of artists and craftsmen in the world they tracked down who could even create the kind of figure they were after, half were in Asia, some were under exclusive arrangements with toy companies, and the rest are highly specialized—they sculpt, but don&apos;t paint, or they paint but don&apos;t design clothes, etc. I represented someone who could pull the entire project together from top to bottom, from concept to figure creation, and, with my background in cinematography, even offer digital deliverables that could go to press with minimal fuss. I was extremely lucky that Epic&apos;s VP Creative, Anita Boriboon, also regarded what I do as a high art form, whereas others she&apos;d contacted spoke about off-loading form creation to digital scanning and 3D printing, with the results being basic, non-poseable, white statues. So first, there&apos;s this notion that we&apos;re dealing not with digital photographs that can be resent if lost, but a physical and valuable objet d&apos;art. Then, there are the licensing fees. I&apos;m not sure, but we may have broken new ground in complexity, because the Epic team was savvy enough to realize they&apos;d need rights, not only to the eventual photos used for promoting Travi$&apos; album, but rights to the underlying artwork being photographed as well. So, they were invested in financial and legal terms, but also, from an artistic and conceptual standpoint, I think they also wanted to protect the avant garde aspect of using a custom action figure to promote an album in lieu of the artist himself—a hella cool, never-been-done-before idea—from being leaked. We joked that it should be in a steel briefcase, handcuffed to the courier. But seriously, the figure did take weeks to craft, and as a prototype, was literally the only one of its kind in the world. With release dates and deadlines looming, you just tend not to take any chances. 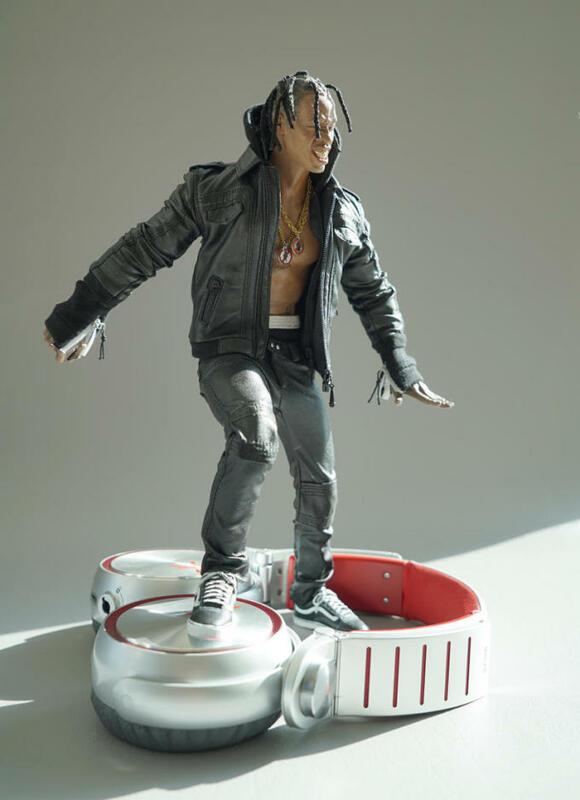 And finally, the discussions as to whether or not some version of this figure can be offered to Travi$&apos; fans, (something Travi$ has expressed interest in) is still ongoing. Was there ever any discussion about you photographing the action figures for them or was the understanding that someone else was going to shoot them? Yes, the early discussions were that I would photograph the figure, and in fact, I performed three shoots of the figure. The Epic team was thrilled at what I sent them and immediately began negotiating for the rights to use them, and, when the album cover concept became more defined, it was also decided by both the Epic Team and Travi$&apos; team that I would do another shoot, in a desert environment, of the figure. Travi$ himself, however, wanted me to fly the figure to NY (where he was at the time) so that his friend Kevin Amato could shoot it and so he could have input. When I was sent some of Kevin&apos;s proofs, I realized Travi$ was after a rawer, grittier yet more playful style of compositions—which, in retrospect, probably fits his music better. What was the interaction like with Travi$? Did he talk about his love for gaming or action figures in general? In discussing the project with Travi$, it became immediately apparent that he was deeply passionate about bringing this figure to life. He was a runaway train of grandiose superlatives when we spoke, I&apos;ll tell you that. He wanted this to happen and would not be denied. So for that, I&apos;m nothing but grateful. It truly was his vision that put Anita on her quest that ultimately gave me the opportunity to do my art. Have you been approached by any other rappers since the word spread about your work? Is there a rapper you would ideally like to work with in the near future? Funny you ask, I was just at the first annual Epic Fest here in Los Angeles yesterday with L.A. Reid introducing the acts, Travi$ was in the line-up, and I saw Future and DJ Esco perform too. I caught up with DJ Esco after their set and chatted. He said he was just talking to someone about Travi$&apos;s figure, and we were both in agreement, there really ought to be a two-figure box set of Future and DJ Esco in 1:6 scale form out there. I told him to tell our friends at Epic to make it happen, so we&apos;ll see. Ozzy Osbourne, who was the headliner, would also make a killer figure. Heck, most musicians would. Can&apos;t really think of another class of people who have better wardrobes, styles and bling, really. The best part of this project, as it was unprecedented for both me and for Epic Records/Sony Music, is we realized—especially in light of how some of my photos were deemed "too realistic"—that for people who have celebrity, musician, or athlete clients whose lifestyles or schedules make them difficult to schedule reliably onto a calendar for a shoot, there&apos;s now this alternative (which may be way cooler and avant garde) of hiring me to craft a hyper-realistic, fully-articulated action figure and deliver polished photos for a fraction of the cost of real-world shoots and travel expenses! So yeah, hit me up.